Collects Star Wars: Doctor Aphra #26-31, Star Wars: Doctor Aphra Annual #2. Doctor Aphra — worst among equals! 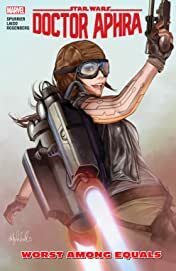 On the run from the law in a massive alien metropolis, Aphra has ten hours to cross the hostile megacity before the bomb implanted in her throat explodes. And don’t forget the pack of bounty hunters and crazed cops that are on her tail. No big deal, right? But there’s one more wrinkle: Aphra can’t stray more than a few paces from her companion without activating the bomb’s proximity alert and blowing both of them up. And that companion is Triple-Zero — a sadistic, murderous droid who’s more interested in Aphra’s death than in playing nice! With undead hunters, monster trappers and the foulest divisions of the Imperial war machine between Aphra and salvation, is this the end for the galaxy’s foremost amoral archaeologist?